Vikings - also called 'Norsemen' or 'Northmen', member of the Scandinavian seafaring warriors who raided and colonized wide areas of Europe from the 9th to the 11th century and whose disruptive influence profoundly affected European history. These pagan Danish, Norwegian, and Swedish warriors were probably prompted to undertake their raids by a combination of factors ranging from overpopulation at home to the relative helplessness of victims abroad. The Vikings were made up of landowning chieftains and clan heads, their retainers, freemen, and any energetic young clan members who sought adventure and booty overseas. At home these Scandinavians were independent farmers, but at sea they were raiders and pillagers. During the Viking period the Scandinavian countries seem to have possessed a practically inexhaustible surplus of manpower, and leaders of ability, who could organize groups of warriors into conquering bands and armies, were seldom lacking. These bands would negotiate the seas in their longships and mount hit-and-run raids at cities and towns along the coasts of Europe. Their burning, plundering, and killing earned them the name vikingr, meaning "pirate" in the early Scandinavian languages. The exact ethnic composition of the Viking armies is unknown in particular cases, but the Vikings' expansion in the Baltic lands and in Russia can reasonably be attributed to the Swedes. On the other hand, the nonmilitary colonization of the Orkneys, Faroes, and Iceland was clearly due to the Norwegians. The Vikings' everyday life was influenced not only by their view of the physical world around them, but also by their religion. They knew the gods lived in Asgard. They knew the gods could help them against evil forces, but they needed to treat their gods well. To sacrifice a valuable animal (blota) to the gods put them in a good mood. To worship the gods was an important part of Viking life. Christianity changed the Vikings' religion, but many of the old customs continued unchanged for hundreds of years. In England desultory raiding occurred in the late 8th century but began more earnestly in 865, when a force led by the sons of Ragnar Lodbrok - Healfdene, Inwaer, and perhaps Hubba - conquered the ancient kingdoms of East Anglia and Northumbria and reduced Mercia to a fraction of its former size. Yet it was unable to subdue the Wessex of Alfred the Great, with whom in 878 a truce was made, which became the basis of a treaty in or soon after 886. This recognized that much of England was in Danish hands. Although hard pressed by fresh armies of Vikings from 892 to 899, Alfred was finally victorious over them, and the spirit of Wessex was so little broken that his son Edward the Elder was able to commence the reconquest of Danish England. Before his death in 924 the small Danish states on old Mercian and East Anglian territory had fallen before him. The more remote Northumbria resisted longer, largely under Viking leaders from Ireland, but the Scandinavian power there was finally liquidated by Edred in 954. Viking raids on England began again in 980, and the country ultimately became part of the empire of Canute. Nevertheless, the native house was peacefully restored in 1042, and the Viking threat ended with the ineffective passes made by Canute II in the reign of William I. The Scandinavian conquests in England left deep marks on the areas affected, in social structure, dialect, place-names, and personal names. In the western seas, Scandinavian expansion touched practically every possible point. Settlers poured into Iceland from at least about 900, and from Iceland colonies were founded in Greenland and attempted in North America. The same period saw settlements arise in the Orkneys, the Faroes, the Shetlands, the Hebrides, and the Isle of Man. Man, Isle of, also spelled MANN, Manx-Gaelic Ellan Vannin, or Mannin, Latin Mona, or Monapia, one of the British Isles, located in the Irish Sea off the northwest coast of England. The island lies roughly equidistant between England, Ireland, Scotland, and Wales. The Isle of Man is not part of the United Kingdom but rather is a crown possession (since 1828) that is self-governing in its internal affairs under the supervision of the British Home Office. The Isle of Man is about 30 miles (48 km) long by 10 miles (16 km) wide, its main axis being southwest to northeast. It has an area of 221 square miles (572 square km). The island consists of a central mountain mass culminating in Snaefell (2,036 feet [621 m]) and extending north and south in low-lying agricultural land. Man's coastline is rocky and has fine cliff scenery. The grass-covered slate peaks of the central massif are smooth and rounded as a result of action during various glacial periods. The island's landscape is treeless except in sheltered places. To the southwest lies an islet, the Calf of Man, with precipitous cliffs, which is administered by the Manx National Heritage as a bird sanctuary. The climate is maritime temperate, with cool summers and mild winters. The average mean temperature in February is 41 F (4.9 C) and is 58 F (14.3 C) in August. The average annual rainfall is 45 inches (1,140 mm). The native flora and fauna are of little interest, but the domestic Manx cat, a distinctive tailless breed (see photograph), is traditionally believed to have originated on the island. The Isle of Man has been inhabited by humans since the Mesolithic Period. It became the home of many Irish missionaries in the centuries following the teaching of St. Patrick (5th century AD). 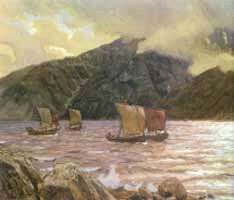 Among its earliest inhabitants were Celts, and their language, Manx, which is closely related to Gaelic, remained the everyday speech of the people until the first half of the 19th century. The number of Manx speakers is now negligible, however. 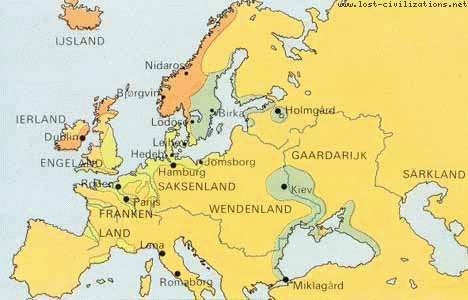 Norse (Viking) invasions began about AD 800, and the isle was a dependency of Norway until 1266. During this period Man came under a Scandinavian system of government that has remained practically unchanged ever since. In 1266 the king of Norway sold his suzerainty over Man to Scotland, and the island came under the control of England in 1341. From this time on, the island's successive feudal lords, who styled themselves "kings of Mann," were all English. In 1406 the English crown granted the island to Sir John Stanley, and his family ruled it almost uninterruptedly until 1736.
zOMG, nub. Gtfo. Write 'bout leader, or I raep. will you play me in chess? I didn't understand Uhh! . this site gave me an F-. all the info was wrong! I loven ze Vikings for a project dur history, dah. Go Vikings! All of this information is worthless! I used this info on my project and I got a D-! You guys should make sure that all of your results are correct before you put it on the world wide web! this site has all its information wrong! I was walking down the street and like this viking came and like stole like my like walet like Fu#k. On day in the land of the pixies Peter Rabbit came and stole Mr Farmers spade, but not his axe, when Mr Farmer heard of this he hunted down Peter Rabbit and cut his F#@king head off. Hi, i did this one from home! I can see there's a desire to be informative here, but you need to get facts and dates right if you're going to broadcast this kind of information. Also, important terms are missing, such as "Danelaw" (and not all of England came under Danish rule). Nice info, I really need it! go vikings! hanga danga derga! happy lief eirikson day!! Terrible writing, the facts are skewed. I would not trust what has being written on this site, a book would serve you better. That is some cool imformation but what about what they made the boats out of or what happened when somebody died? Did you know that they were Vikings? Thank you - I guess my education was negligent as it didn't cover some of these topics. Even the basics are helpful.